Pool Cues1 piece Ramin cue, with brass ferrule and screw- in tip. Do you have a table to sell ? Check out our new Web page to advertise it on here. We have a large selection of second-hand snooker tables including Riley Snooker Tables, Ormes & Sons Snooker Tables,B.C.E Snooker Tables Sovereign Snooker Tables also Hazel Grove pool Tables and Supreme Pool Table available, which can be re-conditioned, partly or fully, whichever is preferred. This is just a selection of products available! If your needs are not met here, please phone or email for further enquiries. Basic accessories Supplied with all tables ie: 4 cues, set of snooker balls,score board, triangle, table brush, set of rest, silver plastic table cover and chalk. Some of the tables include delivery, installation with the price, please see details to each table. Certain tables price for delivery is extra, price upon request. This is an original Riley Aristocrat 9ft snooker table manufactured approximately 1993 by Riley Leisure of Accrington. The table looks almost as new. 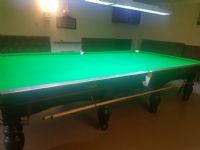 This is a used 12ft x 6ft square leg snooker table A good looking table in very good condition that comes complete with all accessories you need and also including a 6-way brass light canopy and table iron. The 8ft Riley snooker table is in very good condition for its age,and has been very well looked after by it's previous owner. The table was manufactured by E J Rileys Accrington. 8 ft Snooker table Sovereign (Solid Oak) Delivery & installed uk (Ex Showroom) Allmost as new. Birmingham Billiards Mahogany Snooker table, The table is in very good condition and is around 10 years old. Full Size used Sovereign snooker table, fitted with new cloth on bed & cushions good condition supplied with accessories, delivery an installation (uk) included in the price.